Set just after the Russian revolution, in A Gentleman in Moscow, a former state sympathizer is sentenced to house arrest in the posh Moscow Metropol hotel. Within these confines the Count meets three women who, in their own way, stretch his assumptions of how rich a life is possible within the walls he’s been sentenced to. Mixed in are endearing hotel staff – a family, really – and a host of characters from the Count’s past and his still very much intact well-regarded reputation. 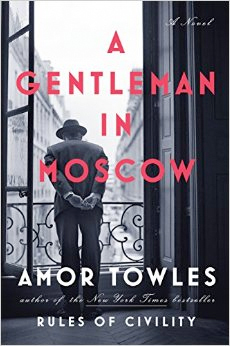 I first heard of A Gentleman in Moscow at my book club’s December meeting where we each wrap a book for a Dirty Santa exchange. I thought the concept was intriguing – not enough to fight for the selection but enough to read it when it started getting passed around. But when Anne Bogel talked about it on the “What Should I Read Next?” podcast, I was intrigued by how she described the A Gentleman in Moscow’s structure as its chapters jump in time in doubling increments (two years, four years, eight years, etc.) and then descend to its denouement in the opposite succession. Any author who is clever enough to frame his narrative like this is worth immediate attention. So, I contacted the book club to see who had taken it home and borrowed it straight away. Clever ended up being exactly the right word for this novel. In addition to its canny framing and memorable characters – both served up in a fascinating literal and cultural setting, this is a smart book. A Gentleman in Moscow is not a page-turning plot-driven narrative, but there’s plenty of life to entreat you back quickly if you do step away.